The following article is from NBCOlympics, used with permission. BEIJING — When Michael Johnson set the 200m world record of 19.32 seconds at the 1996 Atlanta Games, all of the factors that he needed to be perfect for such an achievement turned out to be perfect. NBC track and field analyst Ato Boldon, who won the bronze medal in Johnson’s record-setting 200m race, has outlined the similar stars that must align for Jamaica’s Usain Bolt to break that record in Wednesday’s 200m final. 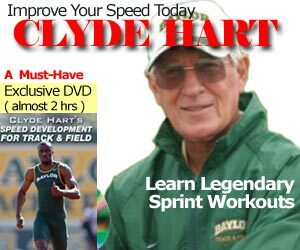 Great tips Jimson Lee, my one stop place for sprint tips. Can you please put up more training tips for the 100m and 200m. Greatly appreciated. @Max – Yes, this blog has taken a side step during the Olympics, but will be back with lots more coaching and training articles after the games. I think Michael Johnson is one of the greatest runners of all time. He’s been famous around the world for being such a good athlete on track and field. Although there are new faces now rising to the top and will soon dominate in the track and field arena.